Demand deficient unemployment occurs when there is insufficient demand in the economy to maintain full employment. In a recession (a period of negative economic growth) consumers will be buying fewer goods and services. Selling fewer goods, firms sell less and so reduce production. If firms are producing less, this leads to lower demand for workers – either workers are fired, or a firm cuts back on employing new workers. In the worst case scenario, the fall in demand may be so great a firm goes bankrupt, and everyone is made redundant. 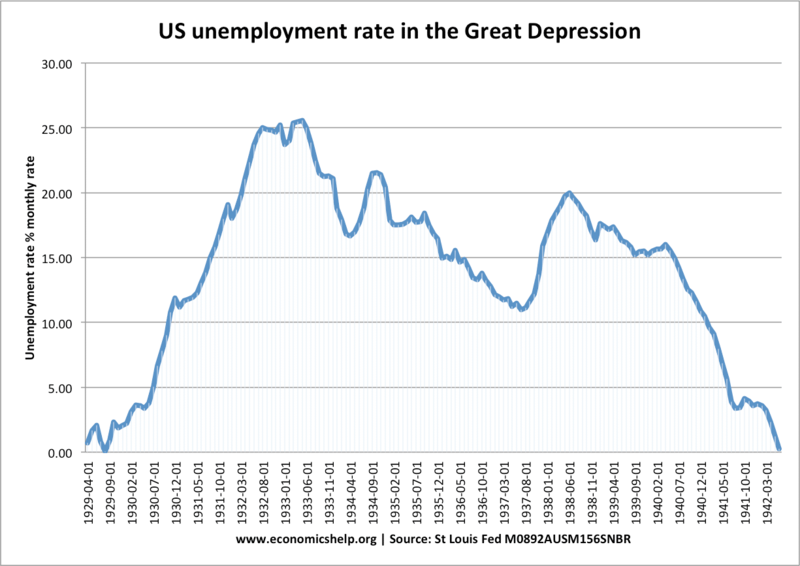 Demand deficient unemployment is associated with the theory of J.M.Keynes who developed his General Theory of Money (1936) against a backdrop of the Great Depression. During the Great Depression, unemployment soared in the US due to the collapse of demand and fall in the money supply. 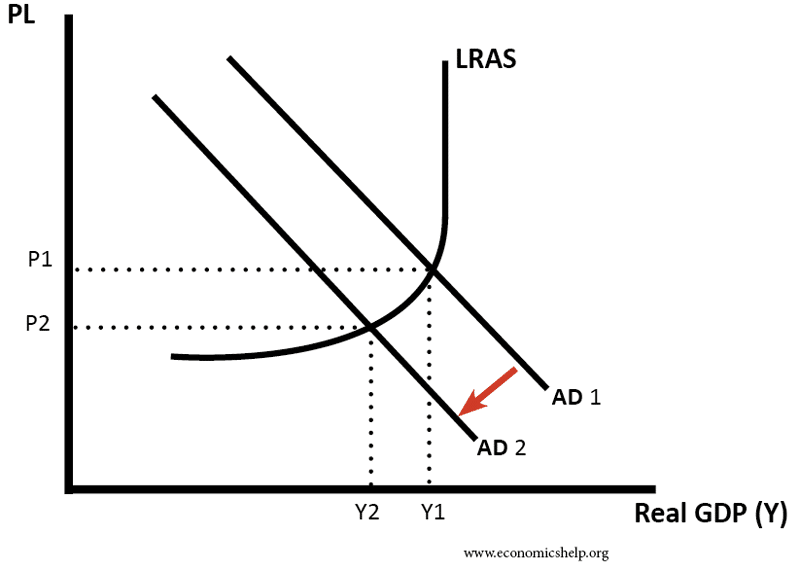 Diagram showing a fall in aggregate demand AD leading to lower GDP and hence higher unemployment. Negative multiplier effect. In many cases, a rise in demand deficient unemployment can further depress aggregate demand and make the recession worse. Rising unemployment leads to lower demand and lower economic output, causing a further decline in demand for workers. Furthermore, the rise in unemployment causes a decline in consumer confidence as households worry that they may be made unemployed. It can create a cycle of falling demand and rising unemployment. Youth unemployment rates. 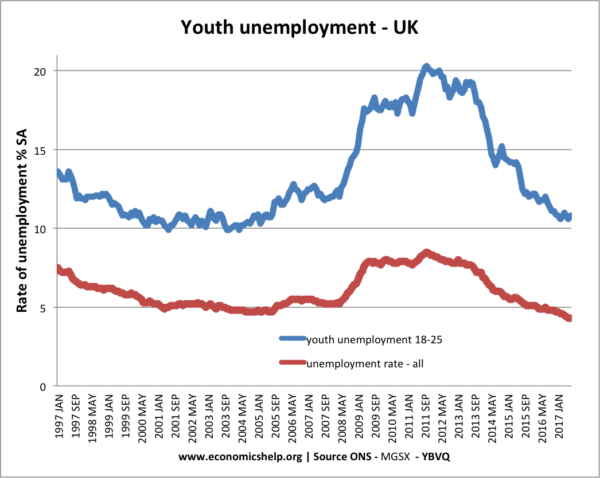 Unemployment rates amongst young workers often increase the most during a recession. Older workers may get laid off, but the biggest brunt is borne by young workers who find firms are not taking on new staff. It is easier for a firm to cut back on hiring new workers than make existing staff redundant under current labour market legislation. It is possible to have demand deficient unemployment even when the economy is growing. Suppose an economy has a long run trend rate of 3%. This means, on average, productivity is growing by 3% a year. If demand only grows by 1%, then there can be a rise in spare capacity and hence a rise in demand deficient unemployment. 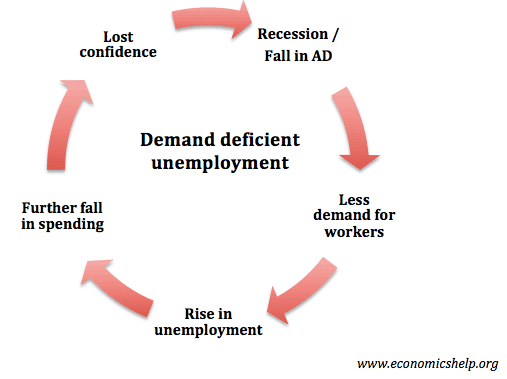 Cyclical unemployment is related to demand deficient unemployment and often used interchangeably. It refers to how unemployment changes with the economic cycle. When the economy is booming, jobs are created, and unemployment falls. When the economy slows down and goes into recession, firms will lay off workers creating the demand deficient unemployment. 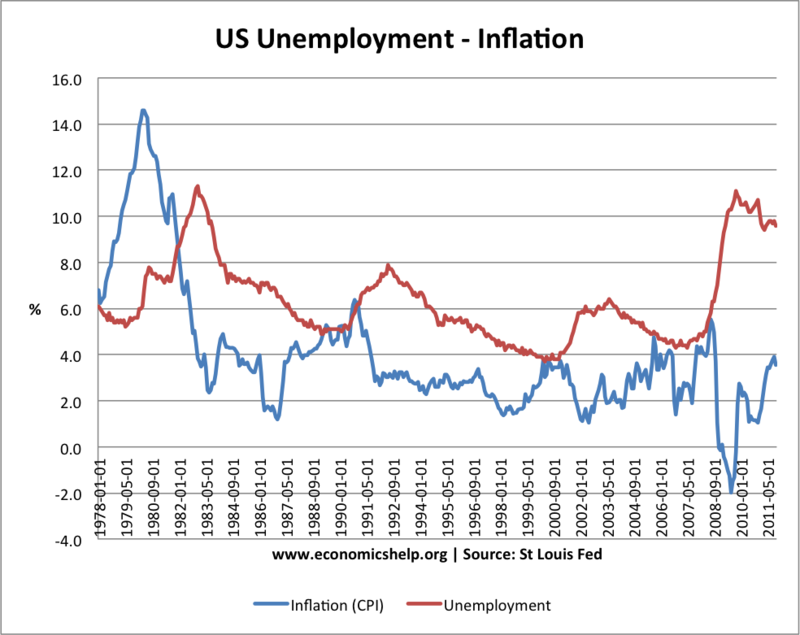 Unemployment in the US increased after 1982 economic downturn and sharply following the recession of 2008. How Long Does Demand Deficient Unemployment Last? 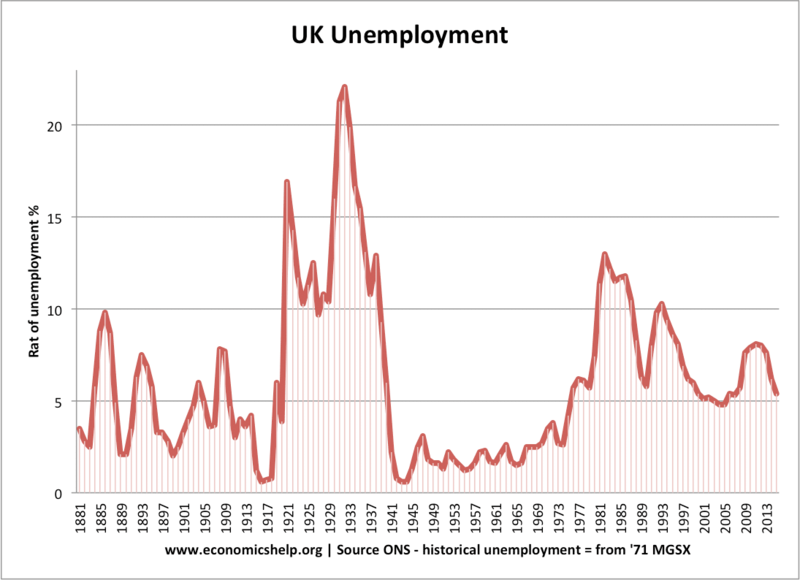 UK unemployment 1881-2015. 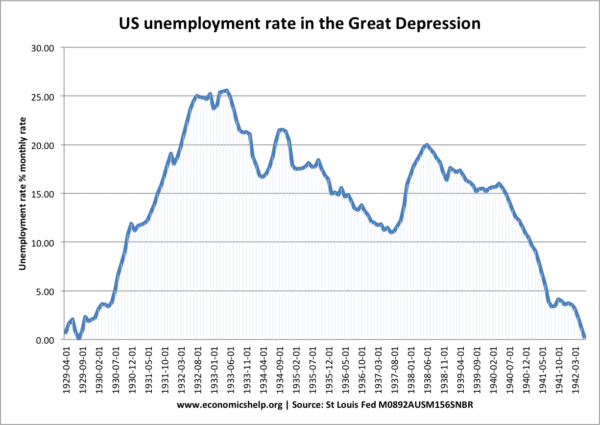 Demand deficient unemployment in 1920s, 1930s, 1981, 1992, and 2008 recessions. Classical economic theory suggests any cyclical unemployment will be temporary. 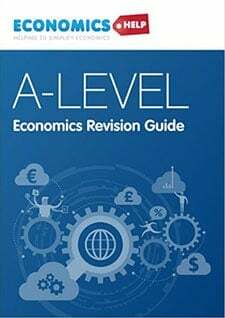 Classical economists argue that if there is a fall in demand for labour, wages will fall to overcome the surplus of workers. 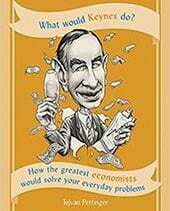 However, Keynes argued that demand deficient unemployment could persist in the long term. Workers may resist nominal wage cuts. Wages are ‘sticky downwards’. Negative multiplier effect. A rise in unemployment will cause a fall in consumer spending and therefore further cause a rise in unemployment. Furthermore, a rise in unemployment can adversely affect consumer confidence and consumer spending. The fear of unemployment can cause a rise in savings which further reduce economic growth. Keynes referred to this as a paradox of thrift. 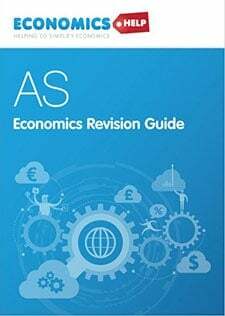 Involuntary unemployment – Keynes argued that deficiency of demand in the economy led to ‘involuntary unemployment’ workers wanting a job at market wage, but insufficient levels occurring. ← Who owns government debt? Just one small quibble with the above article. I’ve always had doubts about hysteresis. I got a French O level forty years ago. I scarcely ever have used the language since. But I can still remember the names of many household objects in French. I.e. I have lost my French skills at the rate of about 2% a year. Plus there is a fellow (worked in the Glasgow city council planning department, but I cannot remember his name) who did a theses on this which claimed to disprove the hysteresis theory. Unemployment marches ever higher because the field of economics doesn’t account for the relationship between population density and per capita consumption. 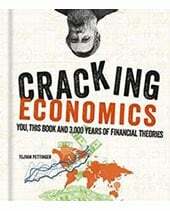 Following the beating the field of economics took over the seeming failure of Malthus’ theory, economists adamantly refuse to ever again consider the effects of population growth. If they did, they might come to understand that once an optimum population density is breached, further over-crowding begins to erode per capita consumption and, consequently, per capita employment. 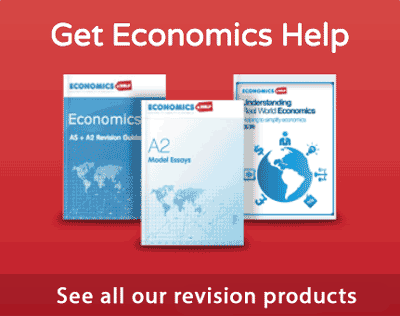 Unemployment cause Unemployment?” Applied Economics Vol 31 No 10 pp 1207 – 18.